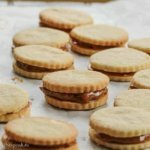 Alfajores are meltingly delicious, crumbly and rich South American sandwich cookies that are surprisingly easy to make–and too scrumptious not to make! 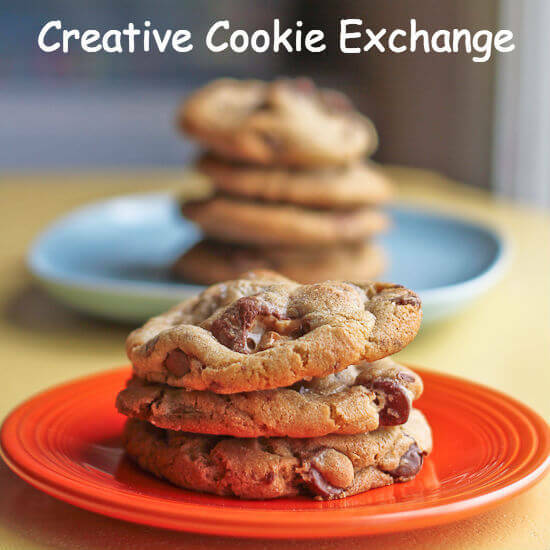 Keep reading to see what everyone else baked for Creative Cookie Exchange this month. Food intimidation (or cooking or baking intimidation) is a funny thing. How often do we get it stuck in our heads that a particular dish is scary or difficult? I still cannot roast a (whole) chicken worth a darn (shhh! Don’t take away my food blogger card). For some reason I have been dying to try making and totally intimidated by Alfajores for a long time now. I decided this was the year I was getting over it. Sometimes–like my few attempts at roasting a chicken–this ends in failure, but more often than not I learn that there was no reason to ever avoid the dish in the first place. I am happy to say that this was a case of the latter, as these cookies are fantastic and fantastically easy. 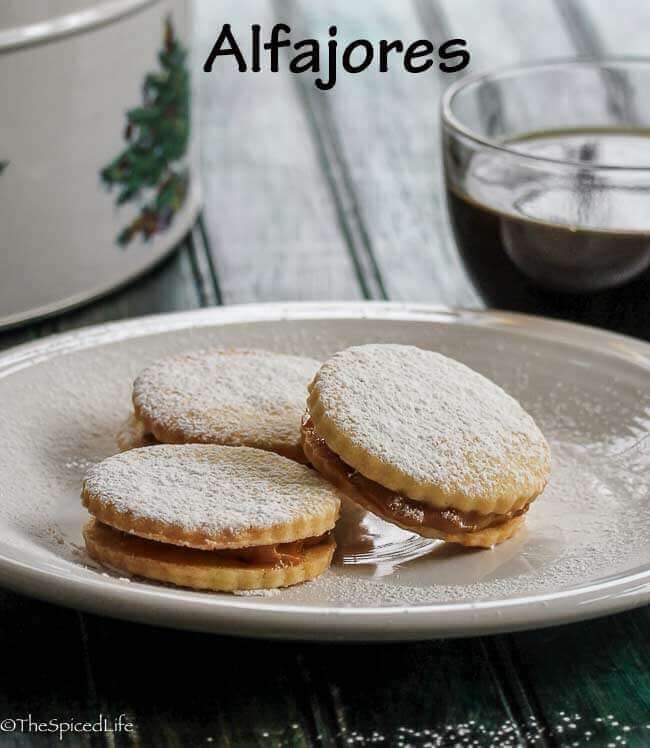 Alfajores are a South American sandwich cookie made with dulce de leche. I suspect they are made all over South America, although I am most likely to associate them with Columbia and Argentina. 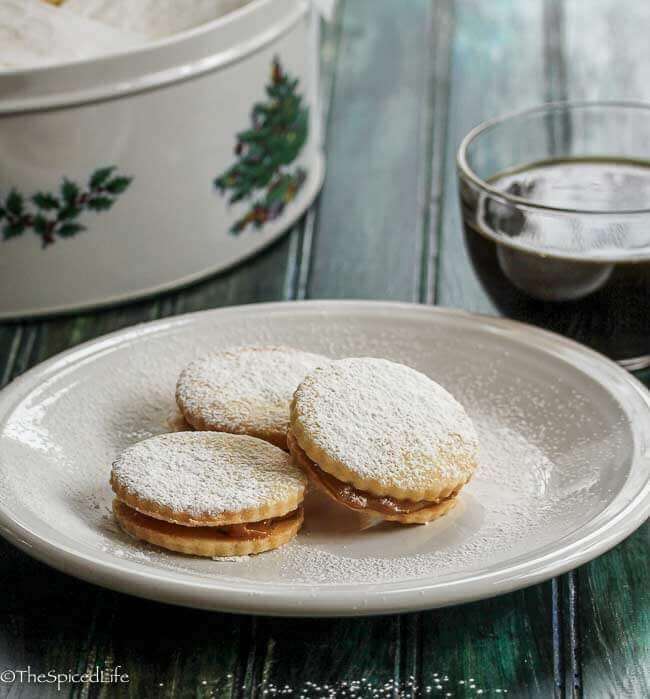 I have seen the shortbread cookie made with ground nuts, but the version most famous around here is made with corn starch, Alfajores de Maicena. The high starch content gives them a melting quality and the cold eggs and butter give them a flaky quality that, when combined, create an amazing texture. You will notice that I used tapioca starch. This is because it is what I had–and Serious Eats made a compelling argument to give it a try. 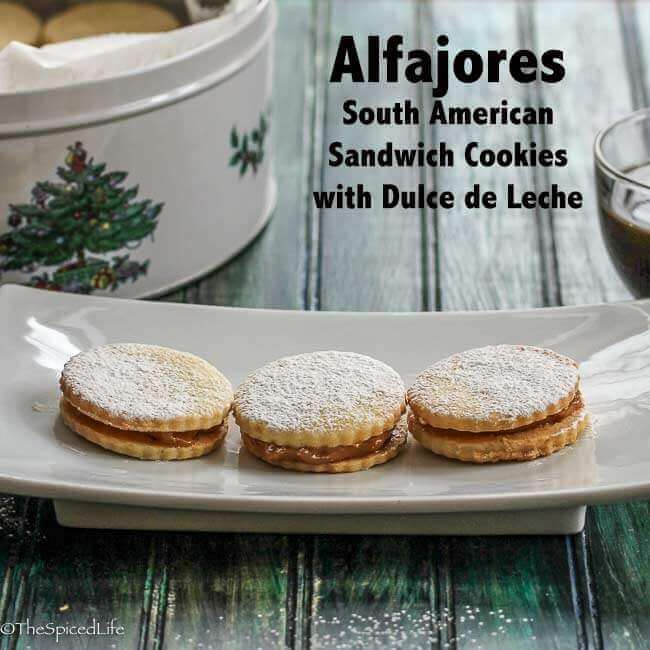 Unlike them however I stuck with my beloved dulce de leche, although I am certain I would also love Alfajores with Cajeta Casera, milk caramel made with goat’s milk instead of cow’s milk. I also chose to add some flaky sea salt to the dulce de leche; I cannot think of an occasion where I don’t think that salt improves caramel. 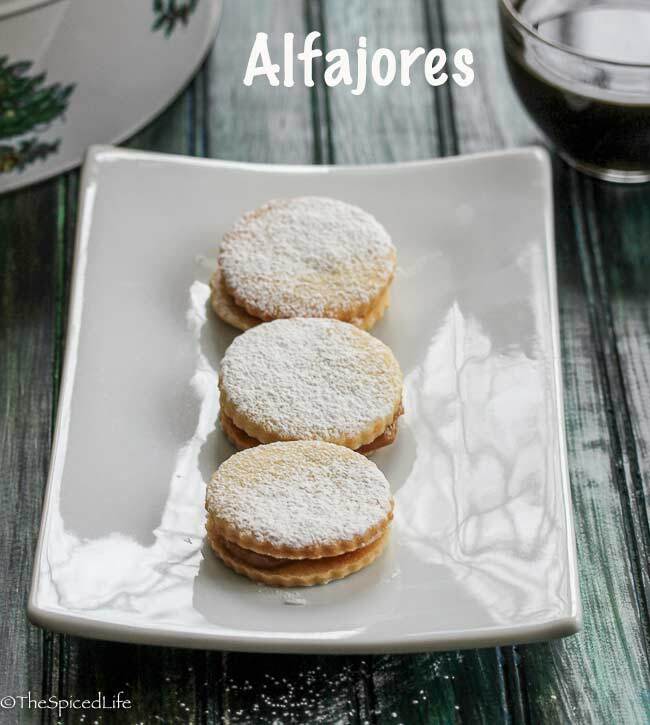 These Alfajores are my contribution to Creative Cookie Exchange this month, and the theme is International Winter Holiday Cookies. Like many international cookies that are baked in this country, I have seen them referred to as Christmas cookies and I have also just seen them referred to as cookies beloved in South America in general. As some of you may recall I have strong opinions about whether something is a good Holiday cookie (i.e., does it do well in a tin), but having never made these before we will just have to wait and see. Heck they may not last that long anyway–I cannot stay out of them! What are you baking for your holiday tins? Adapted from Serious Eats. I chose to follow their suggestion of using tapioca starch instead of the more traditional corn starch because that is what I had. I also used their method (which is also my mom's method) for making the dulce de leche. Place racks at bottom and top thirds of the oven. Preheat oven to 350 F. Line 2 baking sheets with parchment paper. Set aside. Add ground vanilla beans with flour, tapioca starch, powdered sugar, salt and baking powder to the bowl of a food processor. Process to mix thoroughly. Add the butter and pulse until you have a fine, sandy meal. Add egg yolks and continue processing until the dough balls up around the blade--if your house is quite dry, as mine was, it may not ball up. Add up to 2 tablespoons heavy cream in a thin stream until the dough balls up around the blades. Divide dough in half. Create a clean workspace--I like to put down a silicone mat. Dust the surface generously with powdered sugar. Place half of the dough in a ball onto the dusted surface and pat gently into a disc. Dust the top of the dough lightly with powdered sugar. Roll dough until you have a rough circle with about 6 inches in diameter. Dust with more powdered sugar, flip the 6 inch disc, and dust again. Continue rolling until dough is between 14 and 1/8 inch (1/4 inch is more traditional but I found it easier to get closer to 1/8 inch. Either way be consistent). Slide a thin offset spatula under the edges of the dough circle to loosen any places that might have stuck. Use a 2 inch round cutter to cut circle cookies around the outside edges of the dough. Remove those cookies to the prepared baking sheets 1/2 inch apart (1 got 20-25 cookies to a sheet). Slide the thin offset spatula under the new edges of the dough circle to again loosen any places that might have stuck. Repeat cutting out dough circles until you have only scraps. Gather the scraps, briefly knead, and reroll and cut as before. Repeat with remaining dough, until you have used all of the dough. Bake about 9-15 minutes (depending on how thick your cookies are) until just beginning to brown around the edges. Rotate from top to bottom and front to back halfway through baking. Let cool completely on the cookie sheets. There are multiple ways to distribute the dulce de leche. I chose to use a tiny cookie scoop to dollop the dulce de leche and the underside of a spoon to smooth it out. You can also use 2 spoons or a pastry bag. Aim for 2-4 teaspoons of dulce de leche--with such a wide range being suggested to accommodate individual tastes (and using less for thinner cookies and more for thicker). 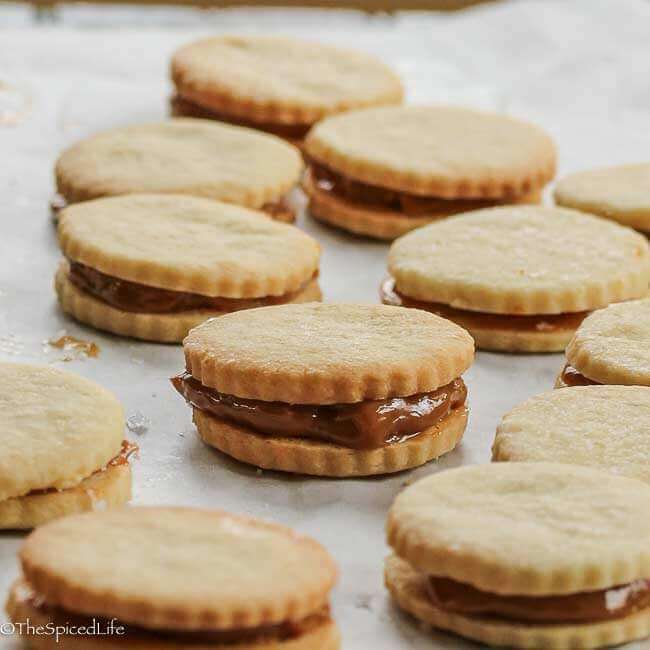 I chose to sprinkle the dulce de leche with flaky sea salt before adding the top cookie to form a sandwich. I think the bite of salt keeps things more interesting and from being too sweet. The salt is not, as far as I know, traditional, so do whatever sounds good to you--or make 2 cookies and do a side by side taste test. I am happy to report these cookies were still amazing without the vanilla, but do use it! If you do not have ground vanilla beans, you can also use the beans scraped out of a vanilla pod. Everyone loves cookies at the holidays–no matter what holidays you are celebrating. And there are so many wonderful traditional cookies all over the world that we have decided to revisit this theme. Check out December 2014 for other choices from our first time doing it. And get inspired to get into the kitchen! Looks like we both did cookies with dulce de leche. That stuff is so good.